Sen. Tim Kaine D-Va., speaks to reporters, as the Senate takes up a House-passed bill that would pay for President Donald Trump's border wall and avert a partial government shutdown, in Washington, Friday, Dec. 21, 2018. "Without a Wall our Country can never have Border or National Security," Trump tweeted Tuesday. "With a powerful Wall or Steel Barrier, Crime Rates (and Drugs) will go substantially down all over the U.S. The Dems know this but want to play political games. Must finally be done correctly. No Cave!" "The opportunity to end all this is staring us right in the face," McConnell said, describing the bill as "the only proposal, the only one currently before us that can be signed by the president and immediately reopen the government." Democrats, who can block most legislation in the Senate, heaped scorn on the proposal, noting it would only temporarily suspend the threat of deportation for a fraction of immigrants brought illegally to America as children — a group placed at risk by Trump's own executive orders. "The president's proposal is one-sided, harshly partisan, and was made in bad faith," Senate Minority Leader Chuck Schumer, a New York Democrat, said. "Now offering some temporary protections back in exchange for the wall is not a compromise, it's more hostage-taking…like bargaining for stolen goods." 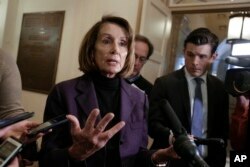 "What the president proposed is granting what he had already taken away," House Speaker Nancy Pelosi said. "DACA recipients had their protections. The Temporary Protected Status, TPS, had their protection. The president took it away and now he's saying 'well I'll give you this back temporarily if you give me a wall permanently.' Open up government." FILE -Speaker of the House Nancy Pelosi, D-Calif., takes questions from reporters on Capitol Hill in Washington on Jan. 18, 2019. ​Pelosi said there is "no excuse" for Senate Republicans to not support the bill that has already passed the House, noting they previously supported similar legislation. "This shutdown will tragically continue until there's another side willing to negotiate," he said. "It requires both sides to compromise. ... The president has taken the first step." Even if the White House package cleared the Senate, it would be dead on arrival at the House. Pelosi has called it "a nonstarter" and promised House votes on border security bills that do not include wall funding. "To reject this proposal, Democrats would have to prioritize political combat with the president ahead of federal workers, ahead of DACA recipients, ahead of border security, and ahead of stable and predictable government funding. Is that really a price that Democrats want to pay to prolong this episode?" he said. FILE - Supporters of the Deferred Action for Childhood Arrivals, or DACA chant slogans and carry signs while joining a Labor Day rally in downtown Los Angeles. ​"I do believe it is a proposal that deserves to be treated seriously," Virginia Sen. Tim Kaine said, adding that the bill should go through committee and be subject to amendments by senators of both parties in order to attract bipartisan support. 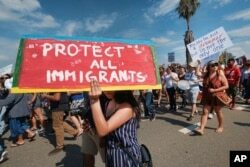 Meanwhile, the U.S. Supreme Court dealt the Trump administration a setback by saying it would not immediately act on an administration request to end the Deferred Action for Childhood Arrivals program started by former President Barack Obama that protects nearly 700,000 so-called "Dreamers" from deportation.